​0.2mm precision! Bring industrial robot to everyone. Effective tool. let everyone can enjoy the joy of it and simplify the life from doing repetitive tasks. 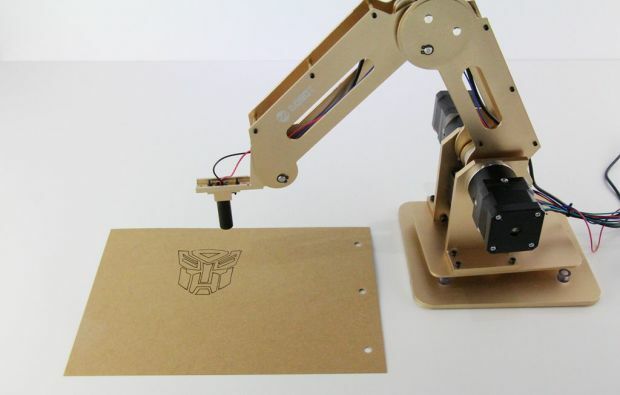 low-cost desktop robotic arm. It calls Dobot. 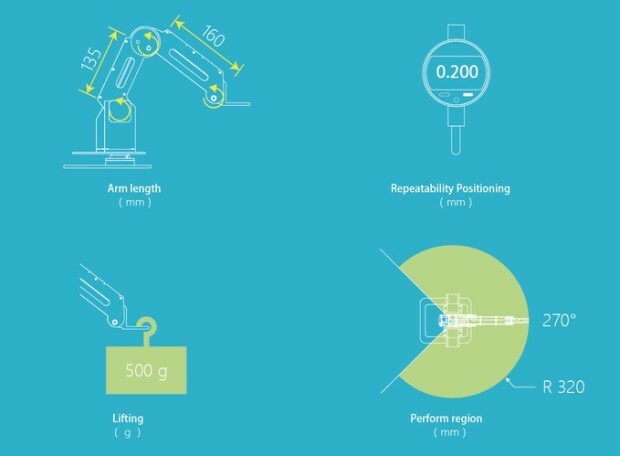 How Dobot Arm make the magic happen? or be typed on a mobile phone that sends to your parents. ​sounds cool, isn't it? DIY the Transformers, Baymax, Mario or other figure you like now ! 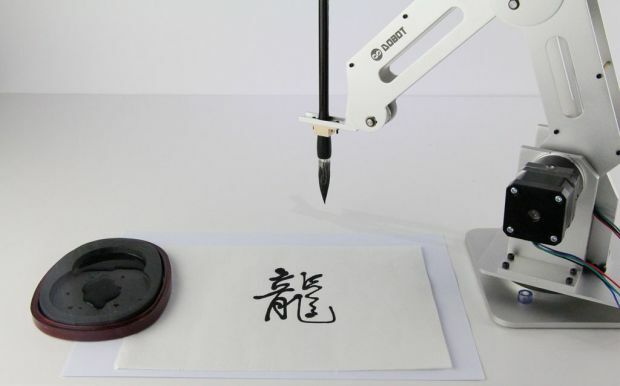 work with 3D printing pen to print anything you want! Dobot’s high precision is the highlight. We spent much of our energy to optimize its technology. With such a low cost, we have managed to maintain the industrial precision level. empowering you to do delicate work without losing the precision. See below for more detailed info on specs. Easy usability comes first during the design of Dobot. and how to help them better control robotic arms. ​mobile APP, EEG, voice, vision, leap motion and gestures, whichever suits your purpose the best. ​and tired our best to make the noise level as low as possible. making Dobot much quieter than low-cost servo robotic arms and more household-friendly. the world better by levering the power of collective minds. ​of the code that need more notations and explanations. we will upload the code. Keep in touch, there are more surprises to come. Even More Exciting For Makers! 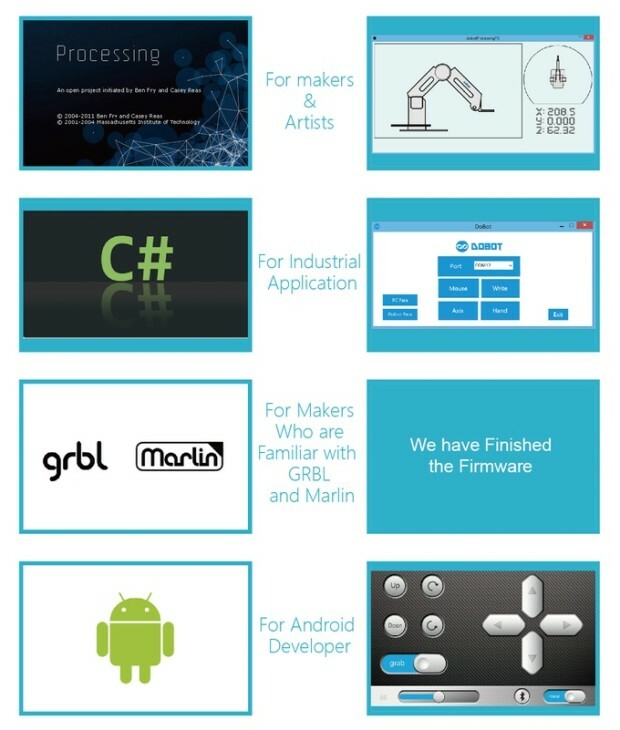 Dobot supports three OpenSource Firmware for special applications and developers with different programming preferences. 1. Complete developed by Dobot team Easy for developers familiar with Industrial robots. 2. Base on grbl (https://github.com/grbl/grbl) Easy for developers familiar with open source CNC machine. 3. Base on Marlin (https://github.com/MarlinFirmware/Marlin) Easy for developers familiar with RepRap compatiable 3D printer. Also we provide communication interface for OpenCV (http://opencv.org/) to add vision to Dobot. 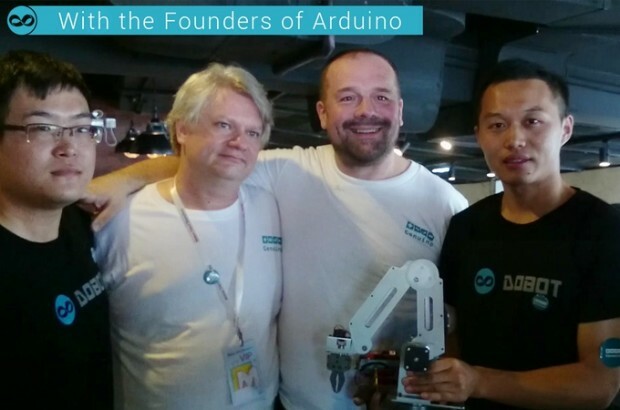 Dobot is a maker team and we create what's best for makers. ​we believe this could equip superb functionality with Dobot. Processing is the widely-applauded data visualization and programming platform for beginners. ​Simply drag and click, you can program Dobot at your will on its user-friendly interface. artists and makers. It helps them to control and program all types of electronic devices and interactive products. Dobot's control is based on the easy-for-understanding serial communication protocol whose working principles are all open-sourced. and believe this will make operating Dobot applications easier for children, enabling them to bring their ideas to life. We have included diversified written motion functions for user to make their own Dobot code community. 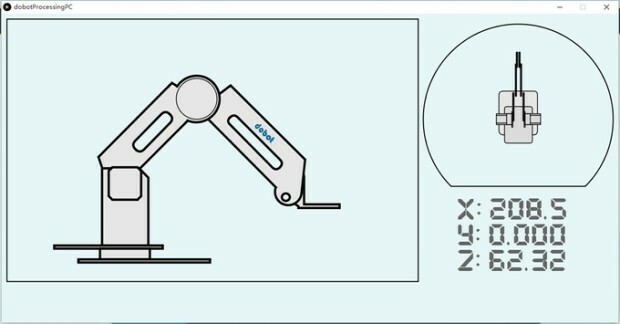 and they are very useful for one who wants to understand how an industrial robot works. combine these functions and you are the magician. and reconsiders the measures for overcurrent protection and heat dissipation. Our core competency is to employ fewer wires with a better outlook ensured. How Dobot is made and how we made its incredible precision level possible. 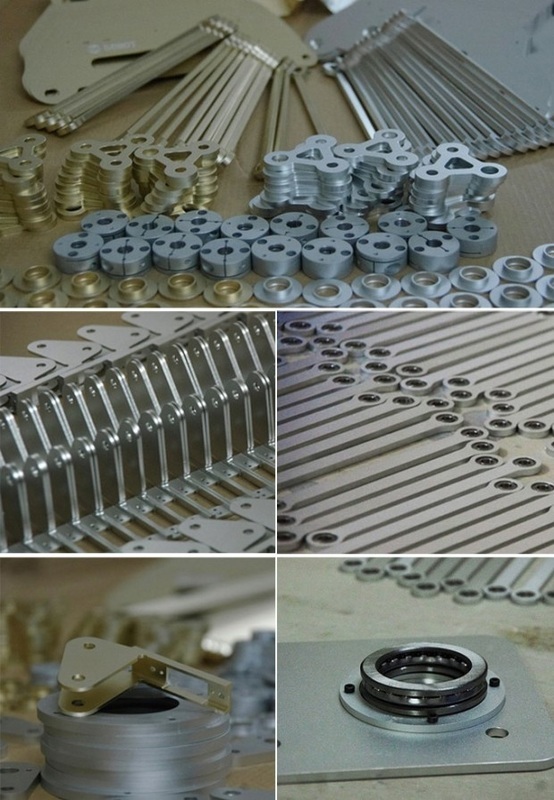 The mechanical structure entirely employed CNC cutting technology. For key parts the machinery accuracy has reached 0.02mm. 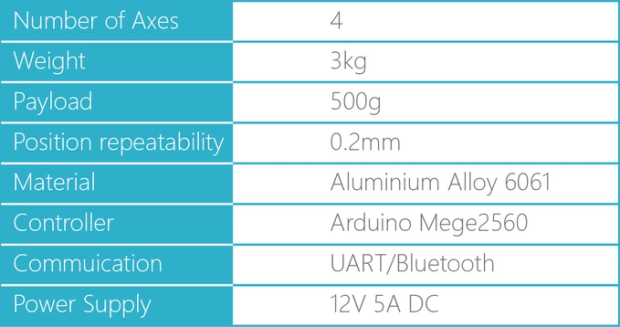 providing consistent motor power for the robot arm. processed by anodic oxidation treatment, to ensure the sleekness and strength of the surface. 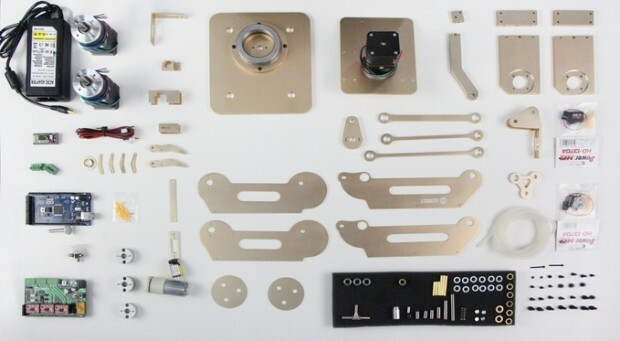 ​machine instead of laser cut to guarantee a 0.02mm precision, which provides the basis of our high quality. For software, we have done a great deal of optimization. ​of the end effector of the Dobot accurately, empowering it with complex curvilinear motions.